The ozone layer is the part of the Earth's atmosphere which contains relatively high concentrations of ozone (O3). "Relatively high" means a few parts per million - much higher than the concentrations in the lower atmosphere but still small compared to the main components of the atmosphere. Although the concentration of ozone in the ozone layer is very small, it is vitally important to life because it absorbs biologically harmful ultraviolet (UV) radiation from the Sun. The "thickness" of the ozone layer - that is, the total amount of ozone in a column overhead - varies by a large factor worldwide, being in general smaller near the equator and larger as one moves towards the poles. It also varies with season, being in general thicker during the spring and thinner during the autumn. In this unit unit we will look at how human activities have resulted in the depletion of the ozone layer and the roles of government and non-government agencies in controlling the restricting ozone depleting substances. ​Stratospheric ozone is a key component of the atmospheric system because it protects living systems from the negative effects of ultraviolet radiation from the Sun. Human activities have disturbed the dynamic equilibrium of stratospheric ozone formation. Pollution management strategies are being employed to conserve stratospheric ozone. To what extent have the solutions emerging form this topic been directed at preventing environmental impacts, limiting the extent of the environmental impacts or restoring systems in which environmental impacts have already occurred? In what ways might the solutions explored in this topic after your predictions for the state of human societies and the biosphere some decades from now? Why has the Montreal Protocol been so successful? Will it continue to be successful? Outline the links between stratospheric ozone and sustainability/sustainable development. What are the greatest threats to stratospheric ozone likely to be, and from where, in the decades to come? 6.2.U1 Some ultraviolet radiation from the Sun is absorbed by stratospheric ozone causing the ozone molecule to break apart. Under normal conditions the ozone molecule will reform. This ozone destruction and reformation is an example of a dynamic equilibrium. Ozone plays a key role in the temperature structure of the Earth's atmosphere. 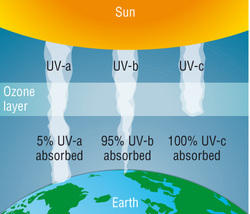 Without the filtering action of the ozone layer, more of the Sun's UV-B radiation would penetrate the atmosphere and would reach the Earth's surface. 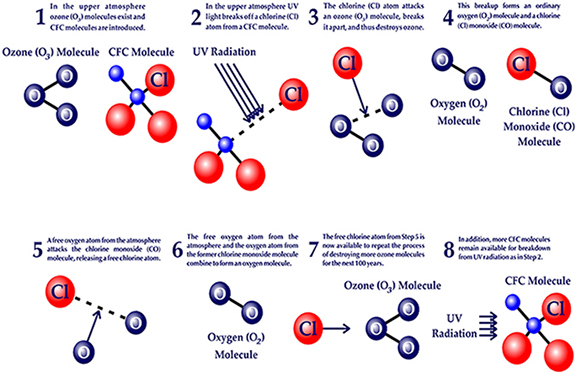 Ultraviolet radiation is absorbed during the formation and destruction of ozone from oxygen. You do not need to memorise chemical equations is not required. 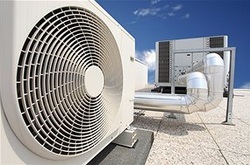 6.2.U2 Ozone depleting substances (including halogenated organic gases such as chlorofluorocarbons—CFCs) are used in aerosols, gas-blown plastics, pesticides, flame retardants and refrigerants. Halogen atoms (such as chlorine) from these pollutants increase destruction of ozone in a repetitive cycle, allowing more ultraviolet radiation to reach the Earth. UV radiation breaks off a chlorine atom from a CFC molecule. The chlorine atom attacks an ozone molecule (O3), breaking it apart and destroying the ozone. The result is an ordinary oxygen molecule (O2) and a chlorine monoxide molecule (ClO). The chlorine monoxide molecule (ClO) is attacked by a free oxygen atom releasing the chlorine atom and forming an ordinary oxygen molecule (O2). The chlorine atom is now free to attack and destroy another ozone molecule (O3). One chlorine atom can repeat this destructive cycle thousands of times. 6.2 U3 Ultraviolet radiation reaching the surface of the Earth damages human living tissues, increasing the incidence of cataracts, mutation during cell division, skin cancer and other subsequent effects on health. 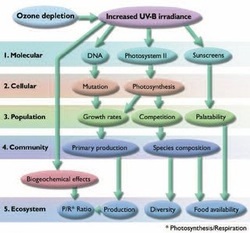 6.2.U4 The effects of increased ultraviolet radiation on biological productivity include damage to photosynthetic organisms, especially phytoplankton, which form the basis of aquatic food webs. UV-B radiation has been shown to be harmful to living organisms, damaging DNA, proteins, lipids and membranes. Plants, which use sunlight for photosynthesis and are unable to avoid exposure to enhanced levels of UV-B radiation, are at risk. UV-B impairs photosynthesis in many species. Overexposure to UV-B reduces size, productivity, and quality in many of the crop plant species that have been studied (among them, many varieties of rice, soybeans, winter wheat, cotton, and corn). Similarly, overexposure to UV-B impairs the productivity of phytoplankton in aquatic ecosystems. UV-B increases plant's’ susceptibility to disease. The effects also include mutation and subsequent effects on health and damage to photosynthetic organisms, especially phytoplankton and their consumers such as zooplankton. Alternatives to methyl bromide (bromomethane). 6.2.U6 UNEP has had a key role in providing information, and creating and evaluating international agreements, for the protection of stratospheric ozone. 6.2.U7 An illegal market for ozone-depleting substances persists and requires consistent monitoring. The black market in ozone-depleting substances (ODS) is a direct consequence of international agreement on targets to reduce and phase-out the production and consumption of such chemicals. The illegal trade in CFCs is undermining the ‘Montreal Protocol on Substances that Deplete the Ozone Layer’. Penalties in may countries are small. As a result of the decline in the production and use of CFCs, and the continuation of CFC production in developing countries, the lure of illegal trade in CFCs is obvious. Significant volumes of illegal imports of CFCs into Western Europe have been reported, even though production in Western Europe ceased at the end of 1994. Unfortunately, the Montreal Protocol currently does not require countries to implement controls against illegal trade, although they have been urged to install verification programs to reduce illegal trade in ODCs. 6.2.U8 The Montreal Protocol on Substances that Deplete the Ozone Layer (1987) and subsequent updates is an international agreement for the reduction of use of ozone-depleting substances signed under the direction of UNEP. National governments complying with the agreement made national laws and regulations to decrease the consumption and production of halogenated organic gases such as chlorofluorocarbons (CFCs). Evaluate the use of ozone-depleting substances, and study the relative effectiveness of these agreements and the difficulties in implementing and enforcing them. Be familiar with what steps national governments are taking to comply with these agreements. 6.2.A1 Evaluate the role of national and international organizations in reducing the emissions of ozone-depleting substances. UNEP (United Nations Environment Programme), forges international agreements, studies the effectiveness of these agreements, and the difficulties implementing and enforcing them. The Montreal Protocol (1987), which is an international agreement on reduction of emission of ozone-depleting substances. The signatories agreed to freeze production of many CFCs and halons and strongly reduce consumption and production of these substances by 2000. Most countries followed the rules but China and India continued to produce and use huge amounts of CFCs. But they have since both agreed to phase out the use of CFCs. ​​​​​​Correct use of terminology is a key skill in ESS. It is essential to use key terms correctly when communicating your understanding, particularly in assessments. Use the quizlet flashcards or other tools such as learn, scatter, space race, speller and test to help you master the vocabulary. The depletion of ozone has global implications to ocean productivity and oxygen production. National economic approaches may have an impact on international environmental discussions. The Montreal Protocol was an international agreement created by the UN—can one group or organization decide what is best for the rest of the world? NASA's been tracking the thinning of the ozone layer the south pole for nearly 20 years. In this slowed-down animation, you can watch the ozone hole's average size each October. Excerpt from the TV documentary series "The Universe"
The signing of the Montreal Protocol in September 1987 launched an unprecedented global effort in the protection of the environment. To this day, the Vienna Convention and the Montreal Protocol are the only universally ratified treaties, uniting 198 countries in taking on the fight against man-made ozone depleting substances.